Where: Memorial Hall - 240 Main Street Northampton, MA. Join us for a show and sale of art and craft made by local, young, emerging makers. 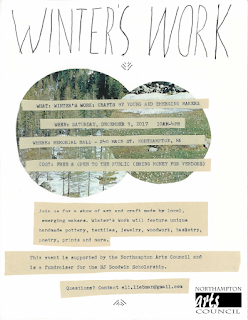 Winter’s Work will feature unique handmade pottery, fabric arts, jewelry, woodwork, basketry, poetry, prints and more. Enjoy the search for quality, affordable, one-of-a-kind crafts and score the perfect holiday gift for everyone on your list. Come to Winter’s Work where you can find beautiful new works by local emerging makers and support arts grants in our community. This event is supported by the Northampton Arts Council and is, in part, a benefit for the BJ Goodwin Grant, designed to provide direct assistance to a Northampton-based artist, writer or arts organization in recognition of exceptional work and to support the further development of artistic talents.